Filmed on location in San Francisco, Alfred Hitchcock’s masterpiece Vertigo (1958) provides tantalizing mid-century glimpses of the City in sparkling VistaVision color. Remarkably, when Scottie (James Stewart) traces Madeleine (Kim Novak) by car back to his own apartment, they cross paths twice with Buster Keaton. It turns out Keaton filmed many scenes from Day Dreams (1922) (inset left) and a key scene from The Navigator (1924) in San Francisco. (You can download a Keaton – San Francisco PDF tour HERE). Why Keaton chose to film here remains a tantalizing mystery. Perhaps it was simply a fun way to combine work with pleasure, justifying trips from Hollywood. Madeleine and Scottie in Vertigo, and Buster in Day Dreams, all traveled east along Washington, with Madeleine and Scottie turning left (north) onto Powell, while Buster, traveling by cable car, turned right (south). 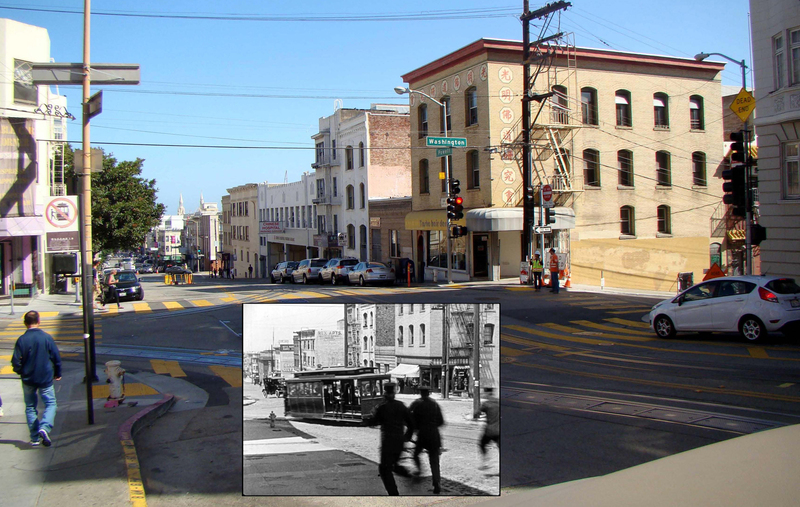 The same building on the NE corner (red box below) appears in both shots, and remains unchanged today. Vertigo – Day Dreams, the same NE corner of Washington and Powell. Keaton (oval) sits in the cable car. Washington and Powell today – nothing is missing, an Art Deco parking structure fills the vacant lot. 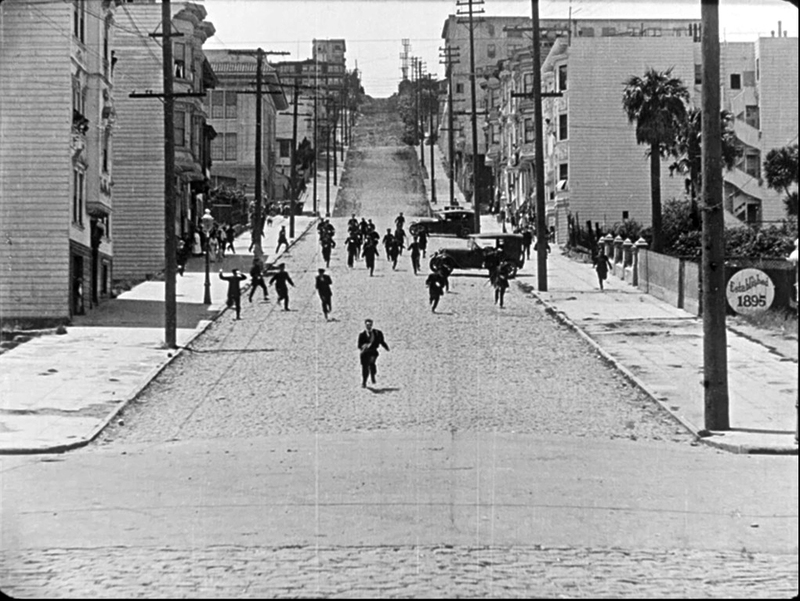 More remarkably, Scottie’s apartment on 900 Lombard overlooked a nightmarish chase scene from Day Dreams, as Buster flees an army of cops east down Lombard from Jones. To begin, as Scottie, dumbfounded, realizes he has followed Madeleine towards his own apartment, his point-of view through the car windshield (below) shows the block of Lombard where Buster fled the police. From Scottie’s car we see Madeleine’s green Jaguar parked beside his corner apartment with red chimney at left, and a clear view down the block Buster fled (arrow) in Day Dreams. 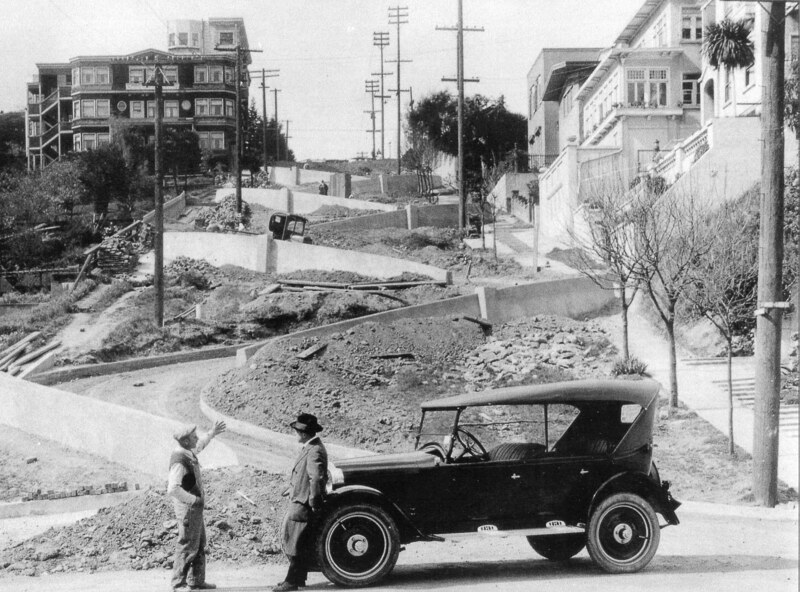 Below, you can even see the corner site of Scottie’s yet to be constructed apartment at Lombard and Jones (yellow) during Buster’s chase, while a Hyde Street cable car (red) passes by along the crest of the hill. 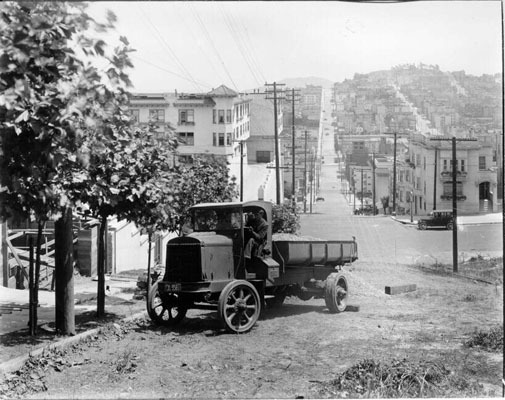 Click to enlarge – view west from Taylor and Lombard – Scottie’s apartment will be built on the yellow corner of Jones. Notice the second floor witnesses to the far left, and the gleeful kids running along to the right. Were the famous twists and turns already constructed, or is the road above the red line (Leavenworth) simply torn up? 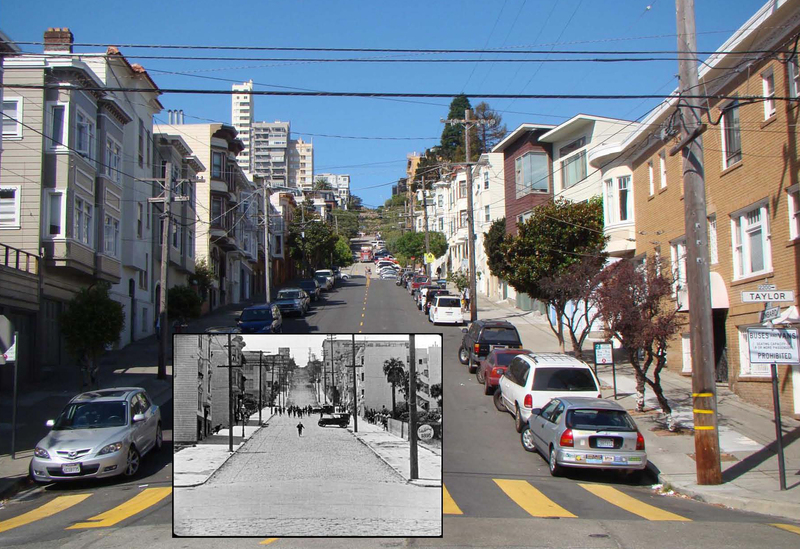 The shot above also reveals further at back the block of Lombard now world-famous for all the twists and turns. To my eye the roadway for the block west of Leavenworth (red line) looks torn up, but before the prominent curved cement retaining walls were installed. I’ve tried to pin down when exactly the twists and turns were built, and when Buster was here filming, but the answers are elusive. The initial plans for the project are dated June 6, 1922, and a further plan, apparently the “as-built” plan is dated December 11, 1922, showing a November 5, 1923 revision regarding the stairways along the street. So the project was likely completed well after August 1, but before the December rainy season. My best guess is Buster filmed here some time during the summer, after the road was torn up in mid-June, but before the major construction commenced. 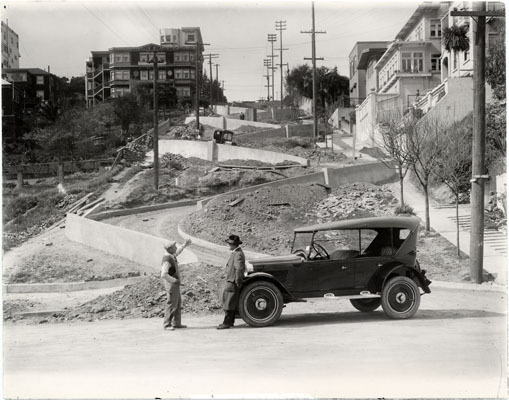 PS – apparently this section of Lombard was two-way until 1939! Can you imagine driving up this street? Lombard looking west – this setting was the very first Keaton location I would identify. 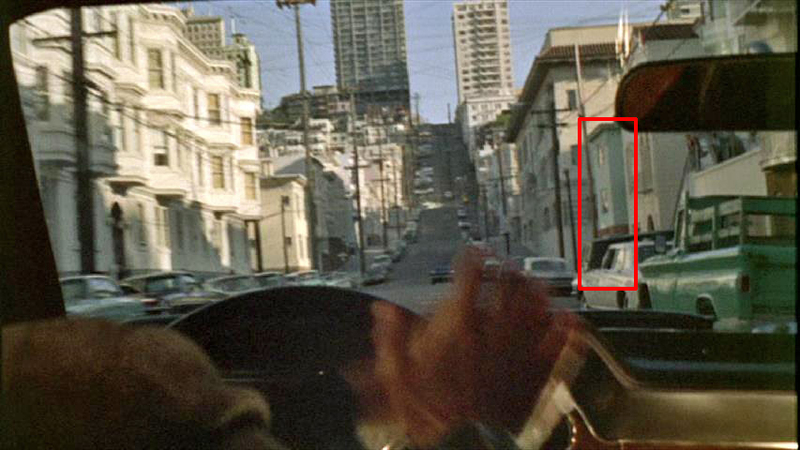 Bonus – during the thrilling car chase in Bullitt, Steve McQueen drives south down Jones towards Scottie’s corner apartment on Lombard (box). UPDATE – intrepid reader ‘Skip,’ who solved the Safety Last! mystery building (the Dresden Apartments, 1919 W 7th Street, the still standing 4 story building human spider Bill Strother climbs early in the movie – read HERE), followed a hunch that the Steve McQueen car chase in Bullitt (1968) must somehow cross paths with Keaton and Hitchcock, and he was right! During the chase, SMQ drives south down Jones towards the corner of Lombard, with Scottie’s apartment (red box above) on the right. 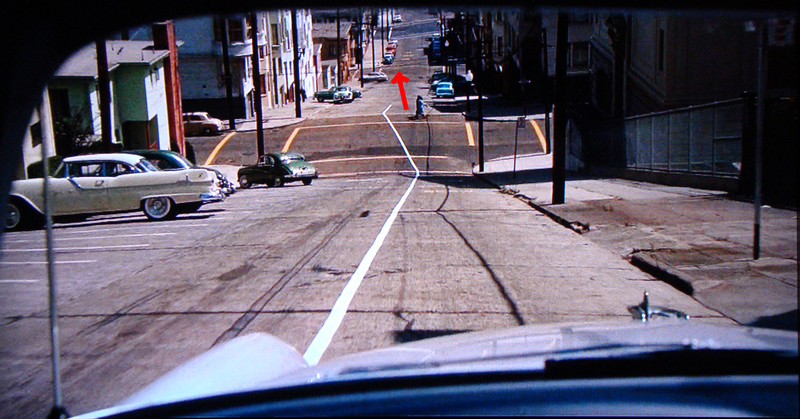 Hitchcock filmed Vertigo in San Francisco in part because its dizzying streets and hills create a mood of imbalance and uncertainty. 36 years before him, Buster recorded his fever-pitched Day Dreams of persecution and pursuit on those very same streets. To see all of the Vertigo filming locations, check out Reel SF. I highly recommend this entertaining and meticulous classic-era San Francisco movie location blog. Vertigo (C) 1958 Paramount Pictures. Day Dreams from Buster Keaton: The Shorts Collection 1917 – 1923 (C) 2016 Kino-Lorber, Lobster Films. Looking east down Lombard towards Scottie’s apartment, in 2011, before it was remodeled. This entry was posted in Buster Keaton, Daydreams, San Francisco and tagged Alfred Hitchcock, Buster Keaton, crookedest street in the world, Day Dreams, Keaton Locations, Lombard Street, San Francisco then and now, Silent Comedians, Silent Comedies, Silent Movie Locations, Silent Movies, Vertigo. Bookmark the permalink. Thank you Rosemary – this was a fun discovery. Layers of history lie hidden everywhere one looks. I think Lombard/Taylor might overlap with another famous chase, Bullitt starring Steve McQueen. I will have to pull out the DVD and check. Thanks Skip – let me know if you find something. Hi John, Thanks for adding that! Cool to find the intersection (literally) of three major stars, along with two particularly iconic post-war SF movies (not to mention two classic chases), all at one corner. I went through the DVD of Bullitt shot by shot to be sure I didn’t miss any clues or locations, but, for anyone interested in more, in addition to the locations for Vertigo at Reel SF they have two entries for the Bullitt chase, one of which is extensive with all the locations (though not every shot). The Daydreams/Vertigo/Bullitt shot shared above is #24 in ReelSF’s “Complete” version (actually #23 and #24) if that helps anyone to spot it while watching the movie. To pile on even further, a few years ago there was a short-lived Fox TV series called ALCATRAZ. The final episode re-created the BULLITT chase scene, even down to multiple appearances by a green VW Beetle. I imagine they took the same route as well. As many times as I’ve been to San Francisco, I just assumed Lombard street was always like that – it never dawned on me that it was done later!